I'm in South-East Asia right now, on an extended holiday. As I write this we're in Laos, an interesting low income country situated in the mountains between Thailand and Vietnam, with the Mekong river as a substantial border. There are a bunch of interesting things about Laos of course, but I wanted to highlight the work of the COPE Centre - a health centre here that aides the many people disabled by the unexploded bombs and mines left over from the extensive secret bombing of Laos undertaken by the US during the Vietnam war. The informed among you may know all about the secret bombings of Laos and Cambodia, and I think I had heard something of them, but one of the pleasures of traveling is the time and context to see some subjects in detail. 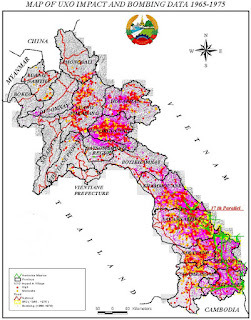 In this case the detail is horrific - huge areas of this country effectively polluted by all the UXO (unexploded ordinance) that remains from the 60's and 70's. The COPE Centre has an excellent visitor centre and exhibit on the problem, as well as what they are doing to help those disabled by UXO. 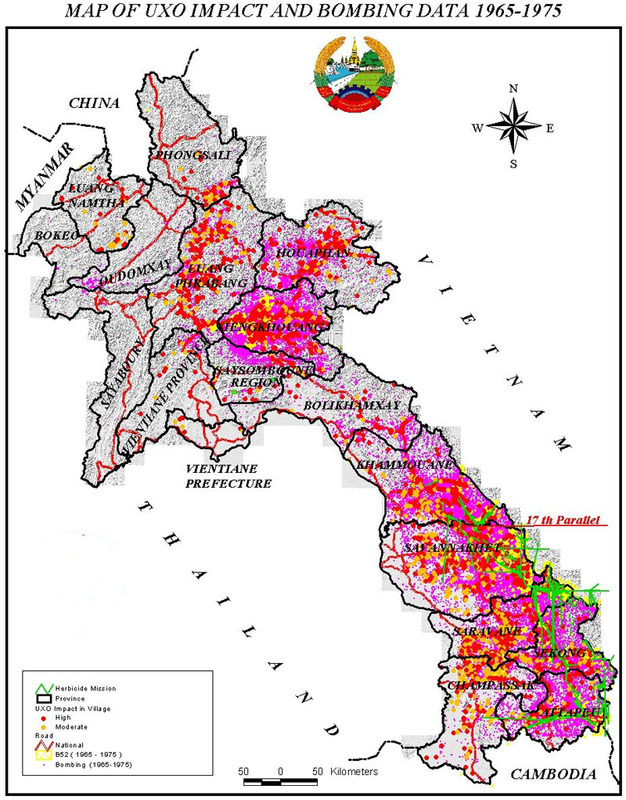 The map is an overview of areas in Laos that were carpet bombed with cluster bombs. Cluster bombs are giant capsules - 1000lbs or so that dispense tennis-ball sized submunitions that scattered over a wide area. Apparently around 30% of the ones dropped on Laos didn't explode on impact, and so constitute a hazard with blast and shrapnel killing radius of around 30 metres. I'm not going to do the subject justice in a short post, and there are many more informed on the subject than I, so I have included the carpet bombing and cluster bomb links above. This 2007 interview with Noam Chomsky was also quite informative. Many of the injuries sustained by UXO are when people are searching through the bomb detritus for scrap metal. With scrap metal prices reaching higher & higher in recent years, and the low-income levels of many Laotians, the risk-reward ratio has been worth it to a substantial number of people. 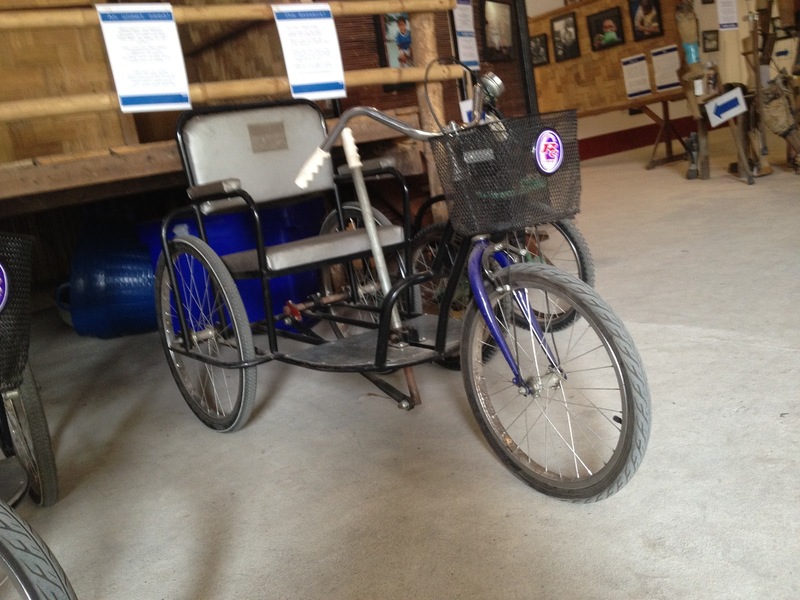 We really liked this pedal-less trike. We saw a few people using them around town, and they were able to get up quite a head of speed without much apparent effort. To my eye they seemed more effortless than a conventional wheelchair arrangement. The COPE Centre accepts donations through their buy a leg campaign. I'm pleased to report that Canada has signed, although not yet ratified (hurry it up Harper!) the international Convention on Cluster Munitions.